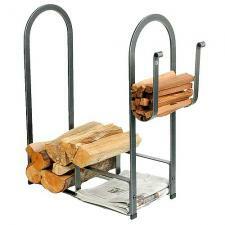 *This rack has it all: a generous log storage area, ample kindling storage, even a neat compartment for newspapers. Our hand-forged rolled ends and distinctive arch design combine to create a classic. *Measures 32" Long x 12" Wide x 34" High. *Quality product made by Enclume in the USA.